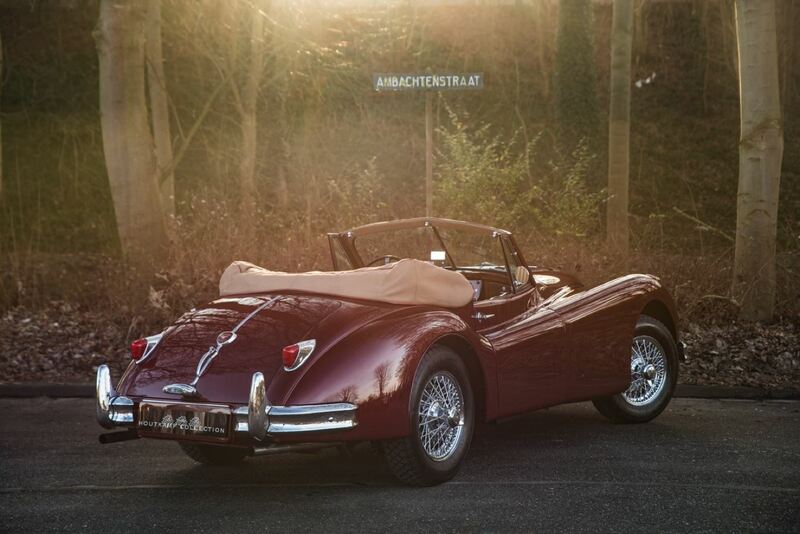 The Jaguar XK 140 was introduced at the 1954 Earls Court Motor Show in Londen. Comparing with it’s former model, the 120 there were a considerable number of changes, some of which had undoubtedly inspired by customer feedback from the American market. According to our customers, the biggest and most welcome difference is the increased legroom. 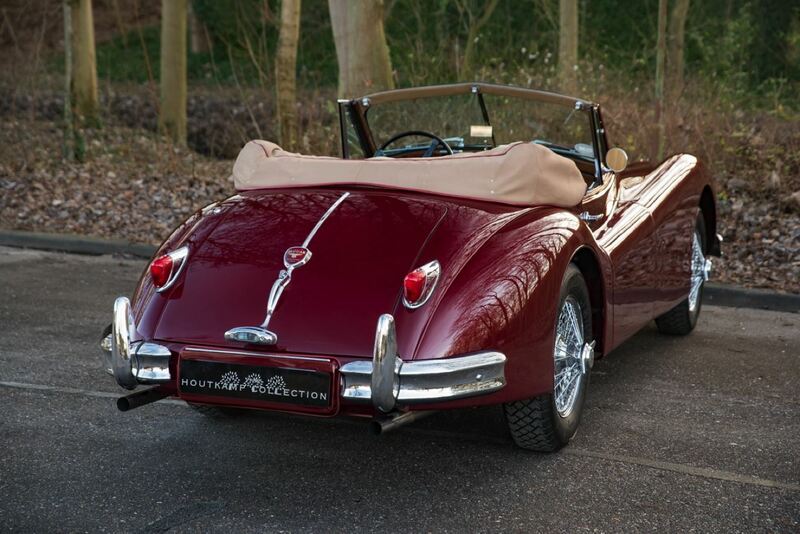 The XK140 was even as the XK120 directly available as Fixed Head (closed Coupe), Roadster (2 seater convertible) and the Drophead Coupe (4 seater convertible). 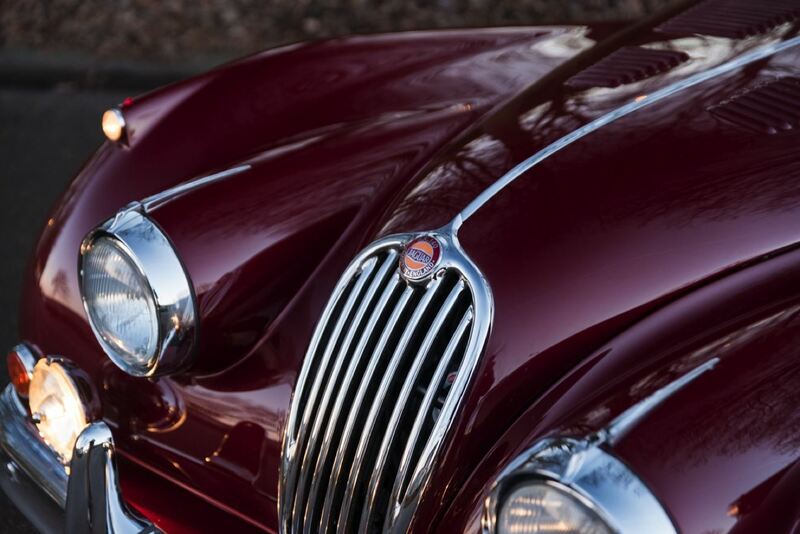 All Jaguar XK 140’s were equipped with 3.442cc 6 cylinder engines which produced standard 190 horsepower. 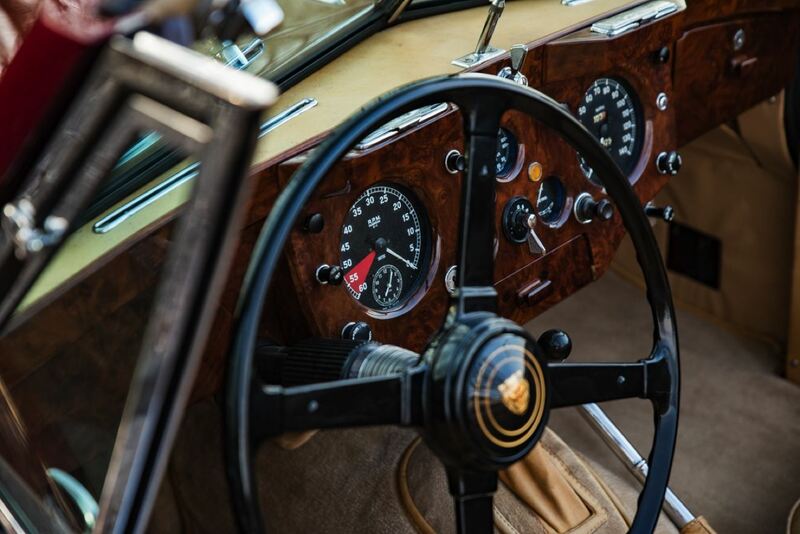 An extra option was the so-called C-Type cylinder head which increased the engine power with 20 horsepower to a total of 210 horsepower. 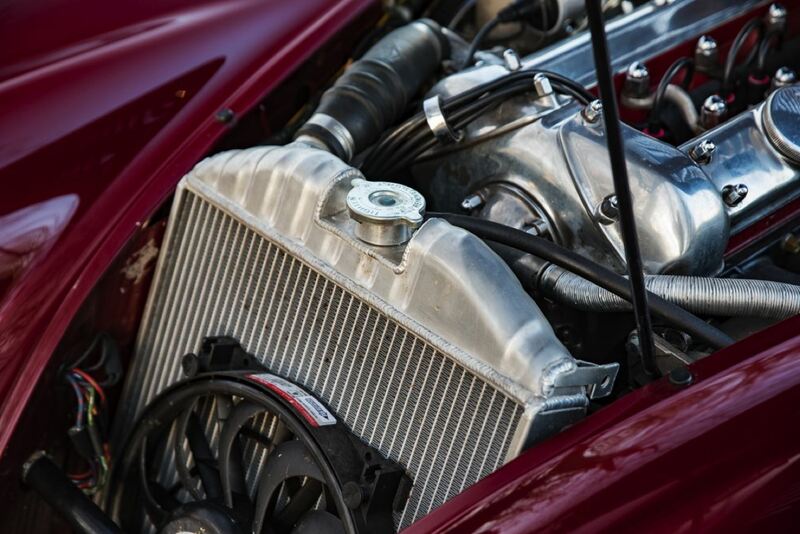 It is relatively easy to recognize a Jaguar XK 140 with C-type engine head because the chassis number needs to start with an S in that case. 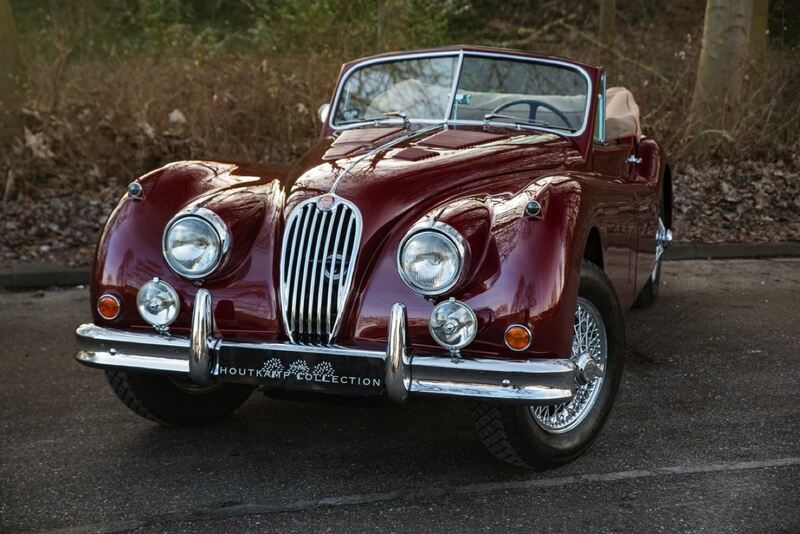 This specific Jaguar XK 140 Drophead Coupe has it’s chassis number starting with an S which means the car is fitted with the desirable C-type engine head from new. Completely honest the increase in power from 190 to 210 sounds impressive but nowadays after recent engine rebuilds, the standard engine gives often the same amount of power. Nevertheless it is a nice addition to the car. This specific Jaguar has been newly delivered in the United States and was delivered via the main distributor Hoffman in New York. 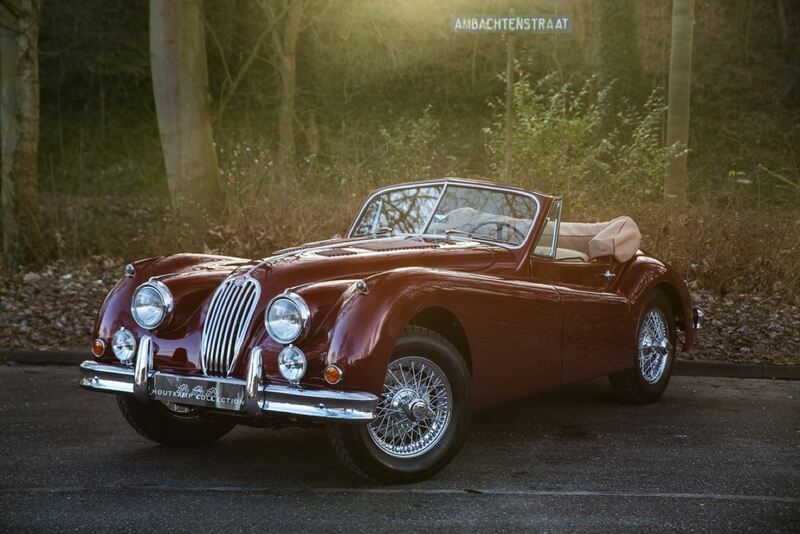 In 1997 the car was brought to Holland via Mr. Stolze who bought the car from a trader in the US named Hyman. 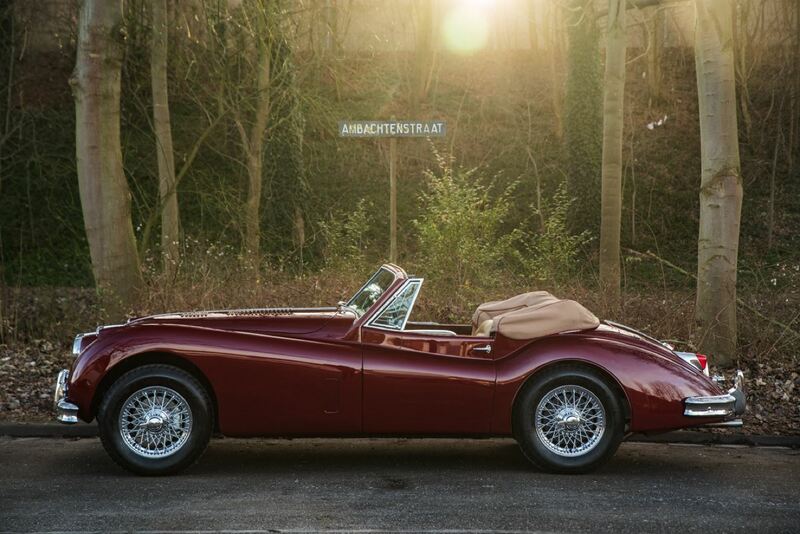 In 1998 the car was transported to a restoration company named Fokkens in Holland. 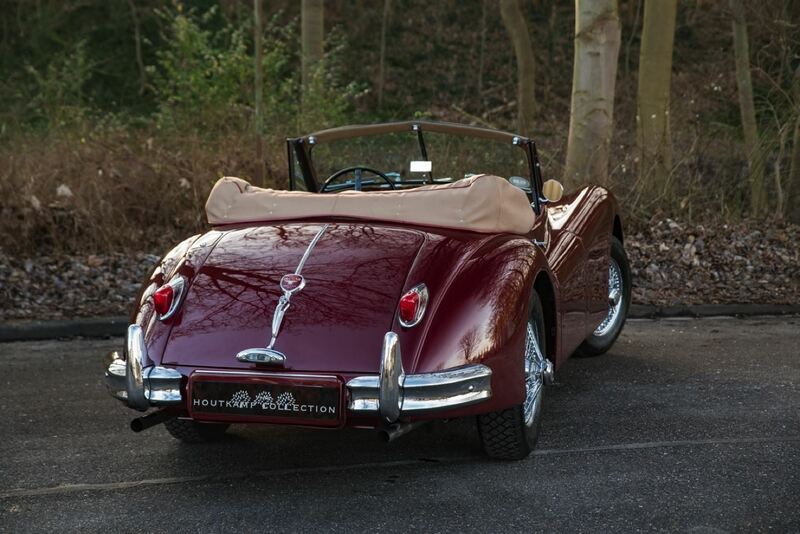 Fokkens carried out some restoration work and a respray of the car was done by Peter Schutte Automobielrestauraties. 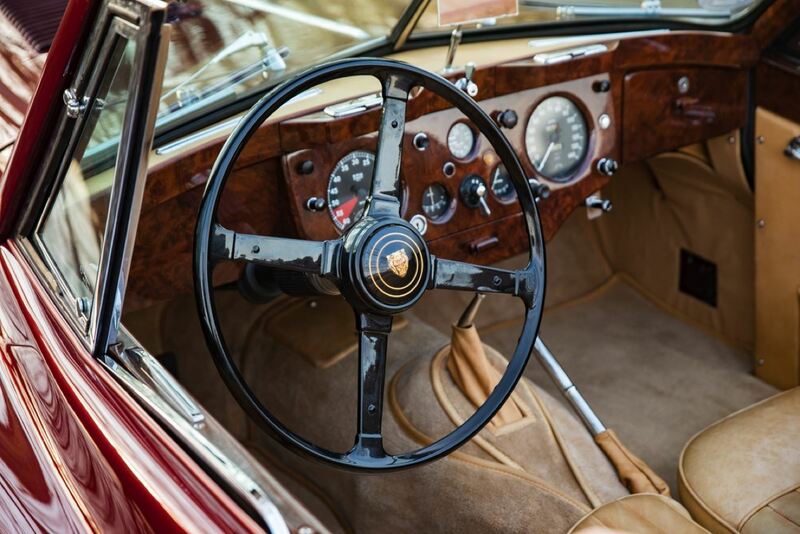 In 2001 or 2002 the owner of the Jaguar brought the car to his local restoration company where an enormous restoration was started. 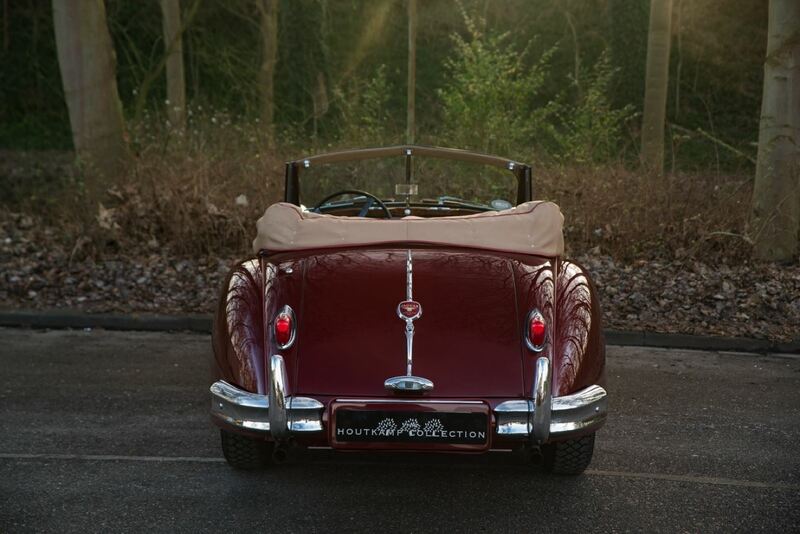 Every single part was taken from the car and completely restored. A file with restoration pictures is available and we can send these pictures on request by e-mail. A restoration can be done on 2 ways. An extremely serious way whereby every part is done or on a cost-efficient way. 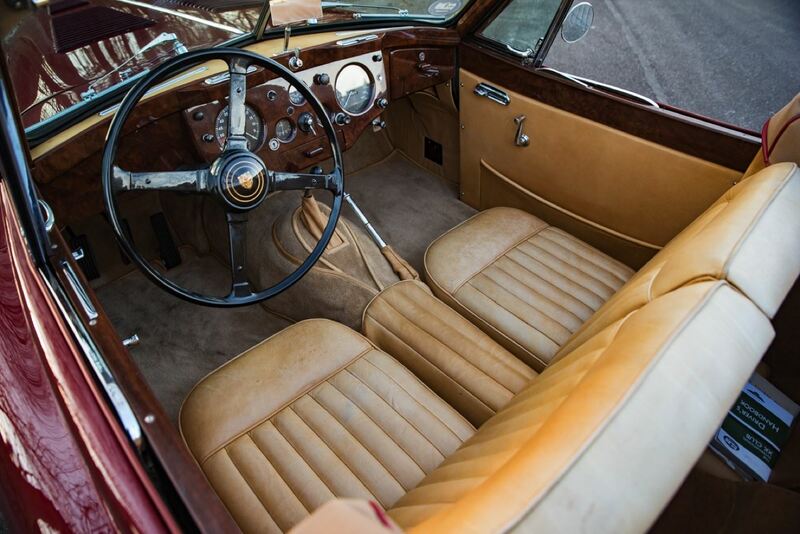 This restoration has been done very extensively without looking at any costs. The final product had to be better then perfect and the result is indeed outstanding. 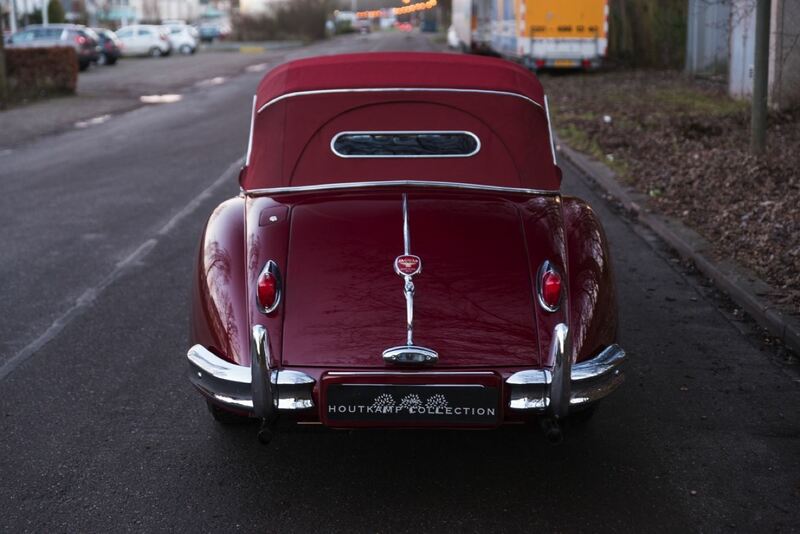 During the restoration the former owner decided to upgrade the Jaguar to get the car as reliable as possible. 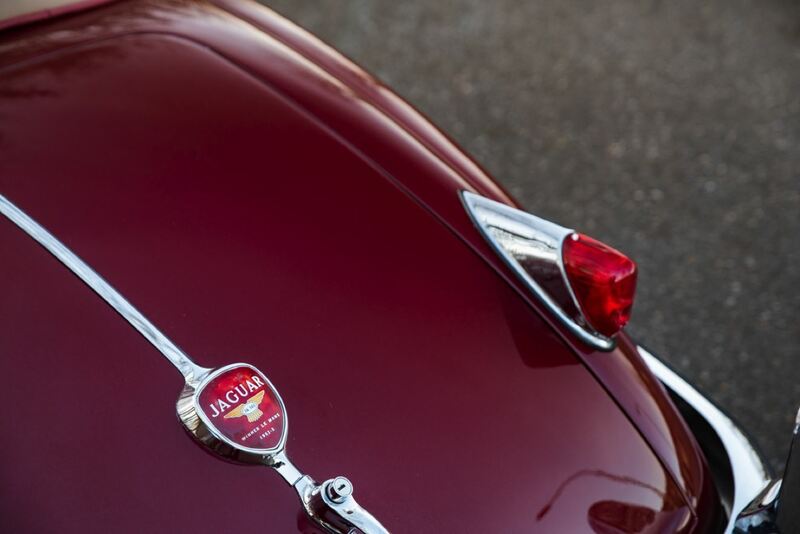 After the restoration the Jaguar has driven a relative small amount of kilometers. 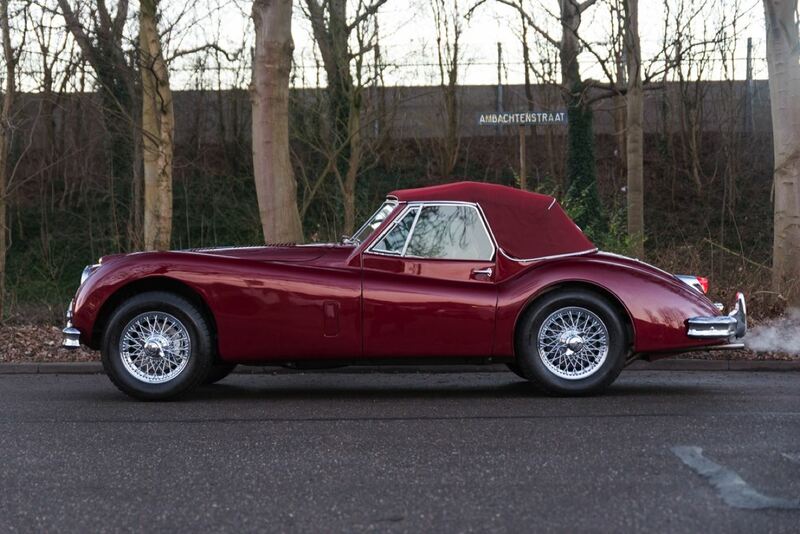 Approximately 2.000 but even after these running in kilometers one can feel immediately that this car is restored without looking at any expenses. For some reason every Jaguar XK is driving slightly different. 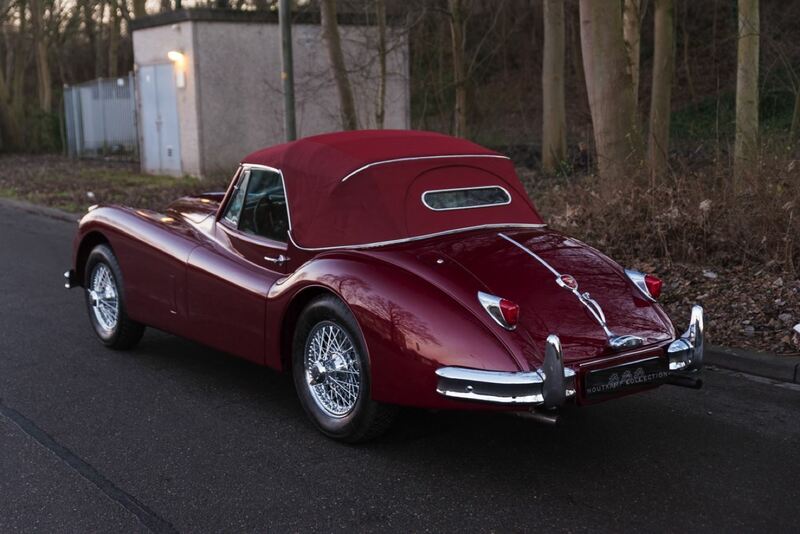 Sometimes an XK has a bit too hard suspension, sometimes the gas is not revving the engine immediately, sometimes the brakes are a bit weak but sometimes we have an XK whereby everything feels as it should be and this specific example is such a car. The engine runs wonderful and is extremely powerful. When the gas pedal is touched, the engine revs up immediately and the engine feels very strong on the whole range from the bottom to the top. The steering is extremely direct even as the brakes. 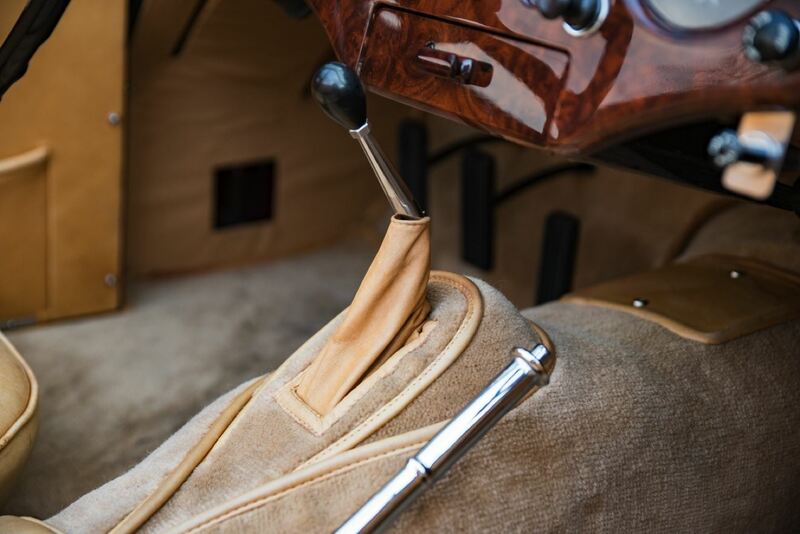 Because the Jaguar is fitted with a more modern 5 speed gearbox the shifting is getting very easily. 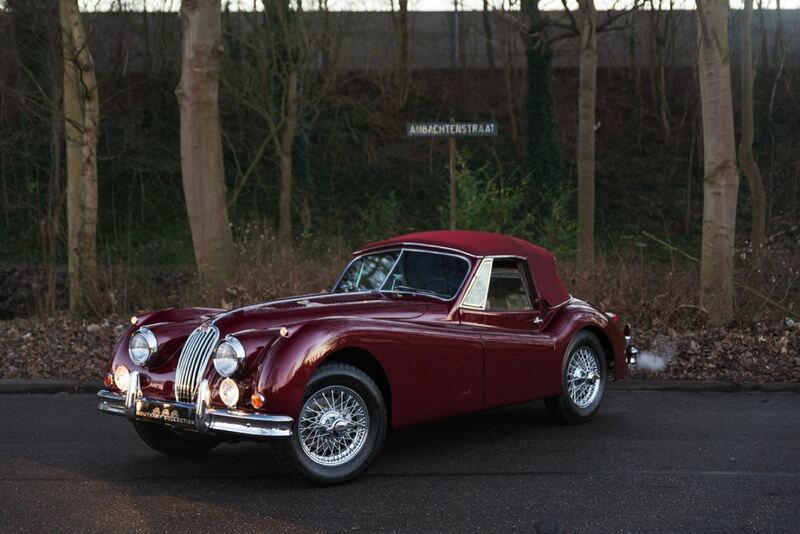 Amongst the superb driving capabilities the Jaguar is also looking impressively nice in the wonderful dark maroon red exterior color with tan/beige leather interior. The body of the Jaguar is extremely nice. The doorgaps are absolutely superb and probably even a bit nicer then new. When we get into details and feel inside the doors, the correct lines are still existing while they are mainly not visible anymore because of incorrect restoration activities whereby plaster has been used on incorrect locations. The chrome on the car is also in an amazing condition. The shine is superb and one cannot find any damage or scratch on the chrome. The windows are all in very nice/good condition order as well. Currently the Jaguar is fitted with brand new chrome wired wheels. 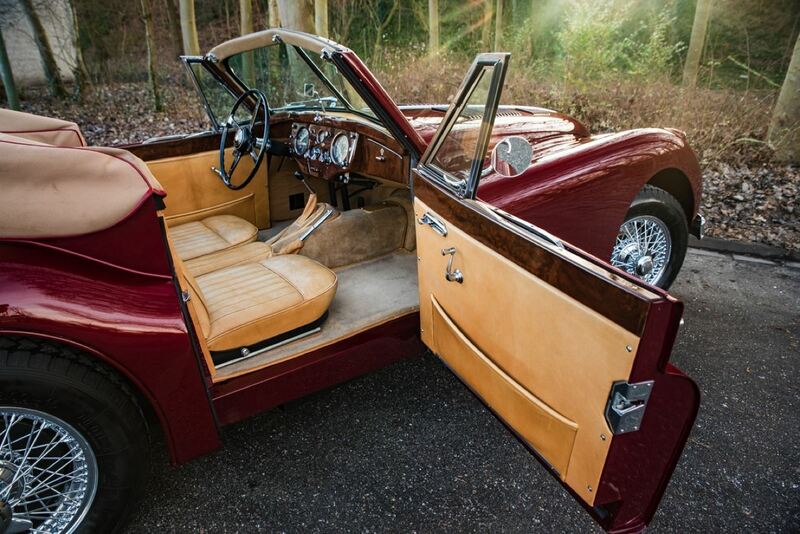 The Jaguar has a beautiful maroon colored soft top and the soft top cover (when the hood is open) is in tan like the interior. Off-course also in an as-new condition. The tan interior suits the outside color of Maroon red very nice. The leather is very special and not the standard set which can be ordered in the UK which is most of the time not perfectly fitting. 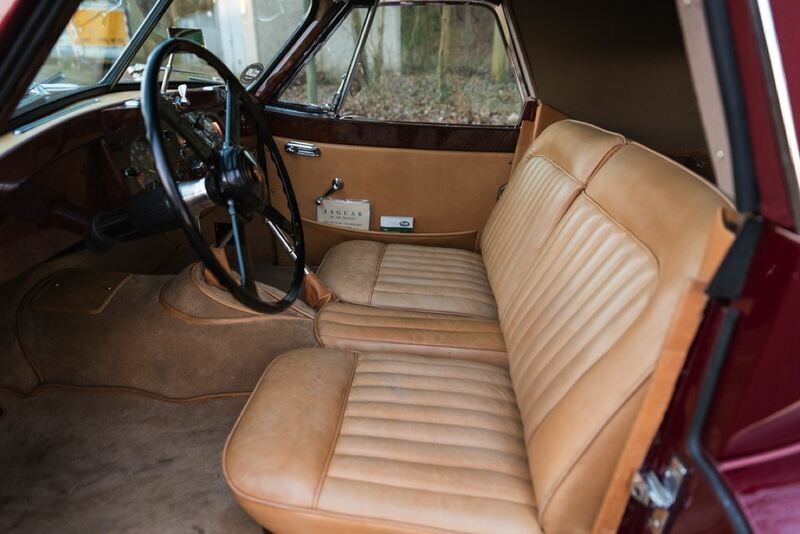 This leather interior has been completely custom made from a very special and very soft leather. 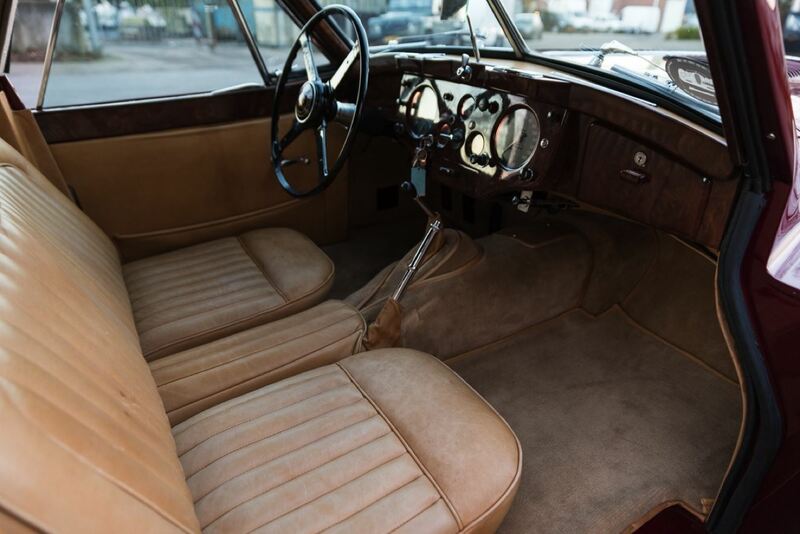 The leather is in a beautiful condition even as the period correct carpets which are also specially made for this car. 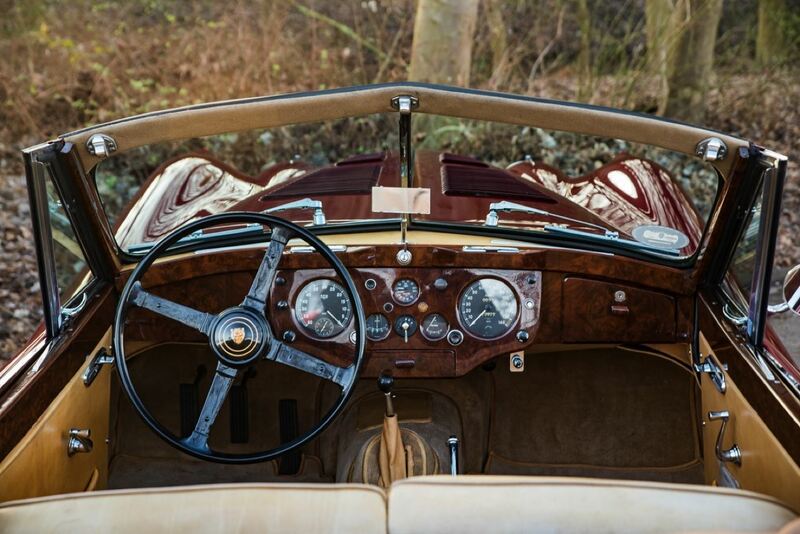 The wooden trim which is in the car has been also entirely restored and has a beautiful shine. All meters, gauges and knobs are working perfectly without hesitation. 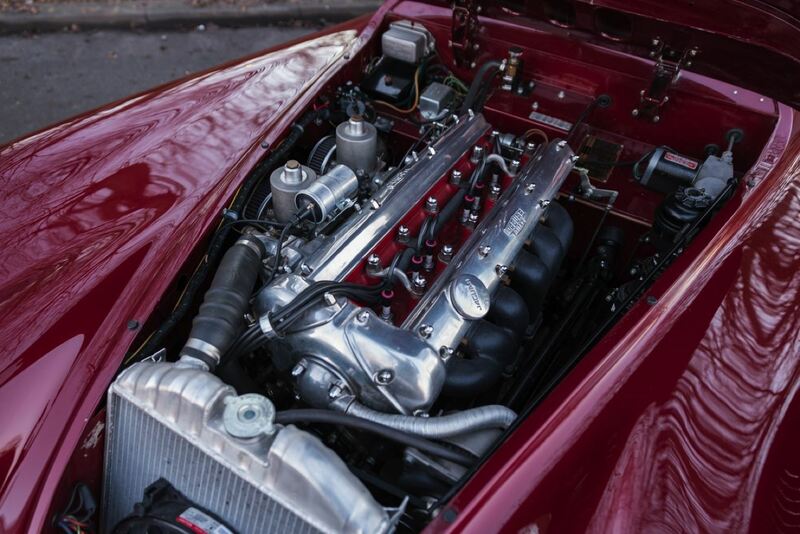 When we inspected this Jaguar before we brought her over to our showroom we were already convinced about the quality of the car but when the engine bay was opened it became even more clear that the car was really nicely and thoroughly restored. 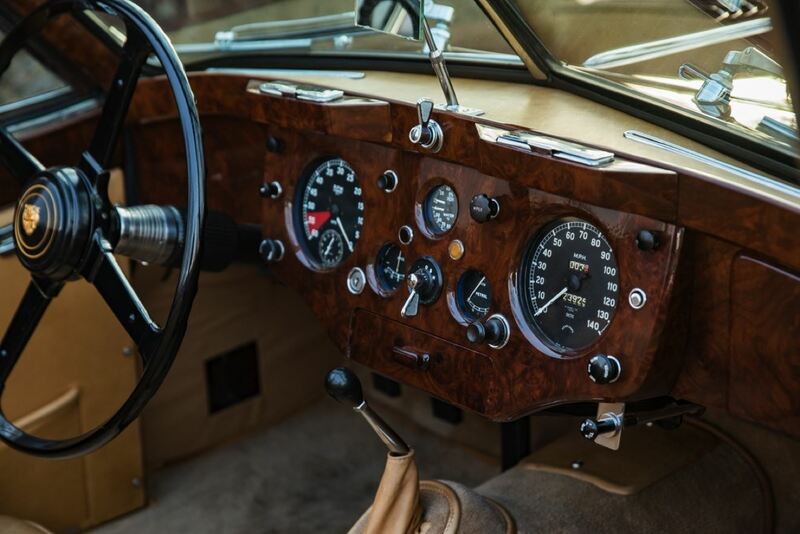 A variety of improvements inside the engine bay are recognizable such as the C-type cylinder head, the 123 electronic ignition, the alternator dynamo, the aluminium radiator etc. etc. But amongst the upgrades, the engine bay is extremely clean and very nice shiny. When the key of the Jaguar is turned, the engine starts easily and it become immediately clear that the engine is running very strong. The power in the car is amazing but this is always with Jaguars. 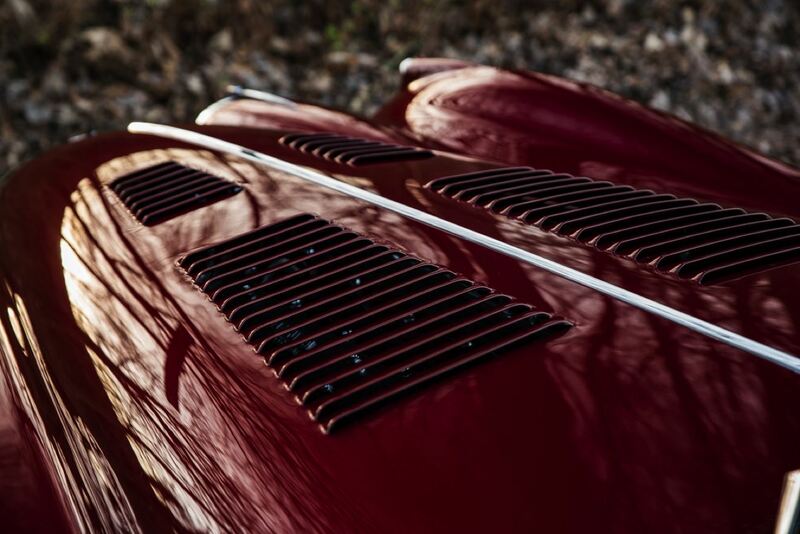 A very nice feature on this Jaguar is the 5 speed gearbox. 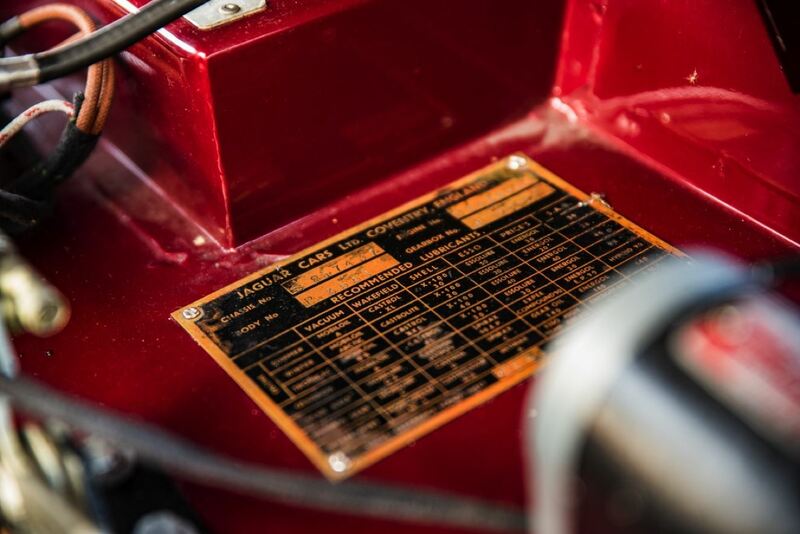 This gearbox has the perfect ratio and gives the power of the engine perfectly over to the wheels. In other words, the car is very strong and fast in the first 2 gears and in the 5th gear it is a superb car to use for touring. The brakes are upgraded with disc brakes at the front and this is a very welcome extra. It makes the car driving completely excellent. This car feels as having a lot of money spend on it. It is a very impressive example to drive around with and she is ready to be taken on a long holiday trip.